Contemporary arrangement for the teenager with room for almost everything. Here are the new vertical cabinets No. 131 and 132, the headboard 189, the clothes rack 204 and to the right are the hangers. Shown in the colors anthracite and blue. 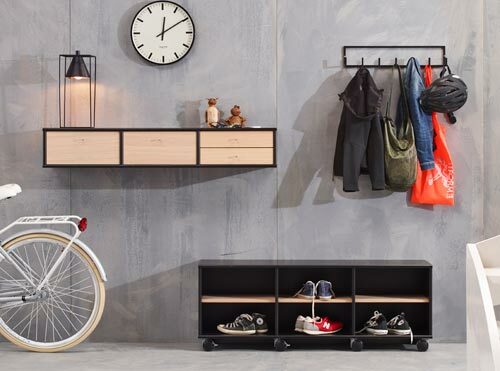 MISTRAL new moduls, headboard, hangers and clothes rack. New elegant cabinet with drop-down front and cabel hole in the bottom. 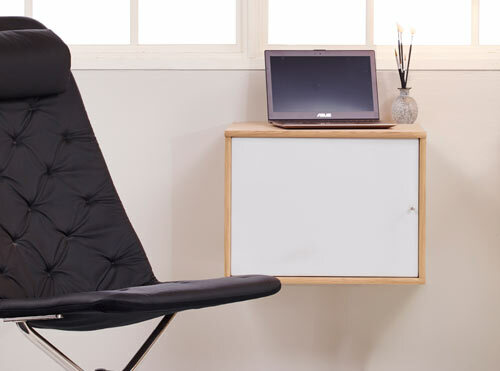 Ideal for tablets and as store room for chargers. Cabinet No. 052 measures W:45,5 x H:42 x D:32,5 cm. 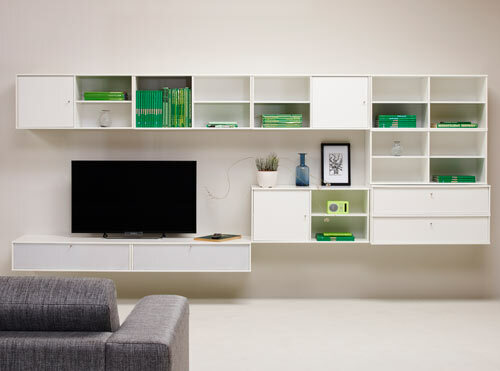 MISTRAL small cabinet with drop-down front. The hangers can be used for clothes and also usefull for headset, hats, scarves etc. The MISTRAL hangers have 2 sizes, the big one has a dia. of 13 cm and the small one has a dia. of 9 cm. 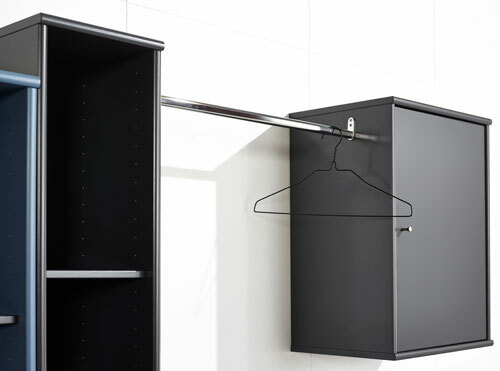 Use our new clothes rack between two MISTRAL cabinets. Length 60 cm, can be extented to 90 cm. The vertical cabinets (131+132) shown in the livingroom. Together with cabinet 041 with drawers (137) and the cabinet with drop-down front (052). Underneath the TV are 3 lowboards (033) on plinths (282) and with flaps (144). Color beige and cappuccino. 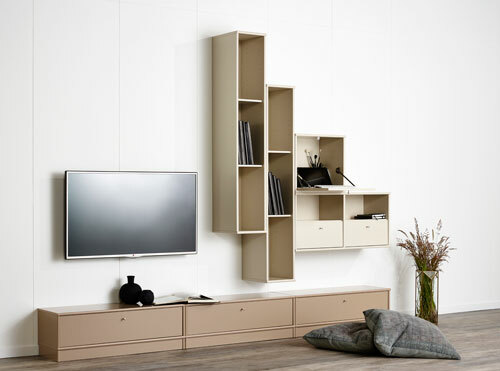 MISTRAL livingroom - vertical cabinets. SPACIOUS STORAGE! SHOE CABINET (70x125x32,5 cm) with 3 drawers for shoes, each with 2 rows for shoes, and a small drawer at the top for keys etc. CHEST OF DRAWERS (89x105x50 cm) with 5 drawers in exstra depth. Really spacious! 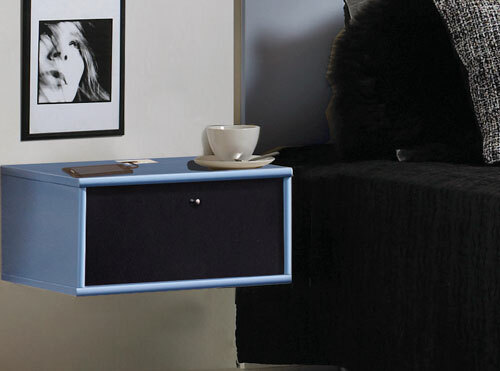 MISTRAL shoe cabinet and chest of drawers. ARE YOU FAMILIAR WITH THIS PROBLEM? Your shoes are piling up in the entrance hall. The beautiful MISTRAL SHOE CABINET (70x125x32,5 cm) with 3 drawers each with 2 rows for shoes and a small drawer at the top with space for keys etc. is the solution to that. BE CREATIVE! Use cabinet No. 113 for shoes. 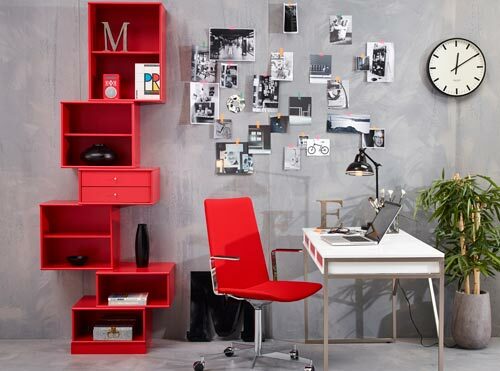 Mount castors and play with colours by adding shelves in contrast colours. We recommend: Place cabinet No. 114 on the wall and use it for checking mails etc. while standing. 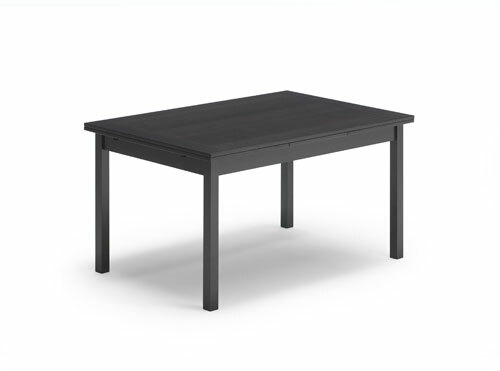 MISTRAL desk No. 302. Available in white with whitepigm. oak matt lac. Here shown with drawers/trays No. 172 also in whitepigm oak matt lac. 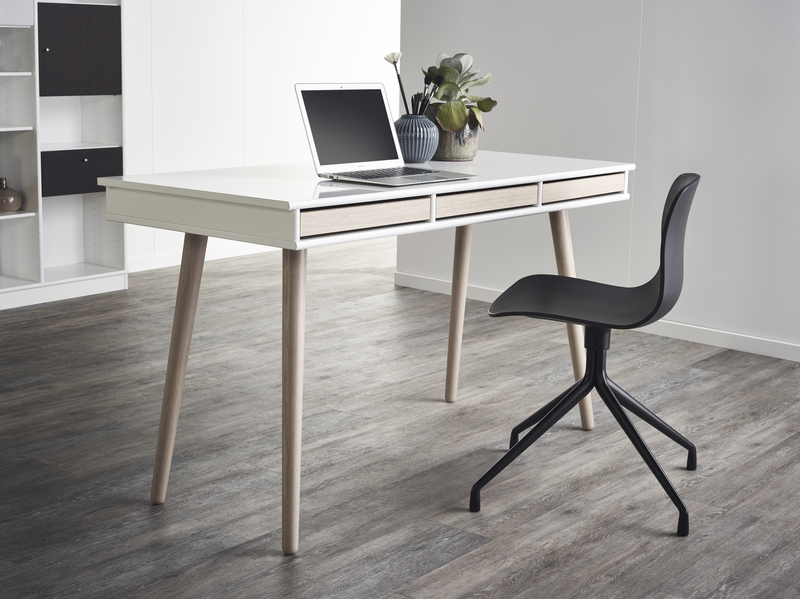 MISTRAL desk with wooden legs. Your working files, your paper mess and your computer are easily stored befind the drop-down front. The LED light (incl) switches on when the drop-down door is opened. Bottom and front are rubber coated. Drawer with push-to-open fitting beneath the drop-down front. The cabinet can be used as a bar, too! MISTRAL No. 004. Cabinet with drop-down front. 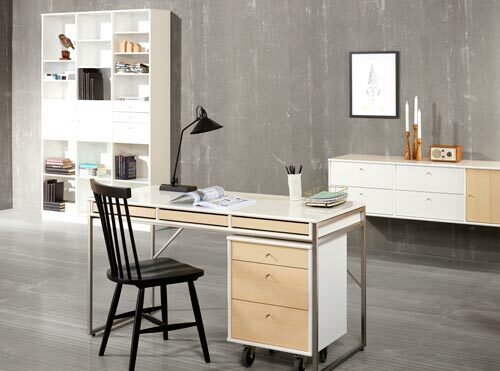 Elegant office with MISTRAL. Desk with trolley, in the back the MISTRAL bookcase.To the right: MISTRAL AV cabinet No. 232 is used as sideboard. All cabinets in white in combination with fronts in oak soaped veneer. Do you want to show or hide? This customized solution includes cabinet No. 004 with drop-down front, light and drawer. Spacious drawers and trays for paper stuff. 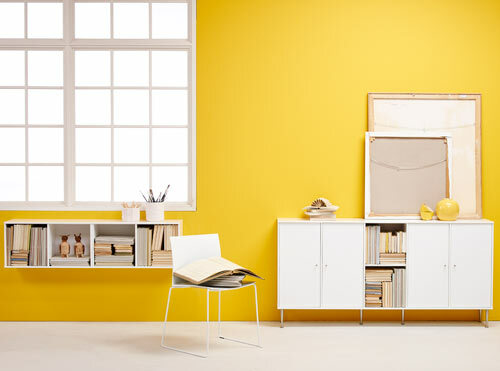 Cabinets are shown in white but are available in MISTRAL´s 15 lacquered colors and veeners. Play with depths, assymetry and colors. This arrangement in red is functional yet sculptural. Use matching colour on the trays for the desk. Trolley with elegant, sleek back. Small drawer No. 071, big drawer No. 073 as well as trays No. 172 fit in the trolley. 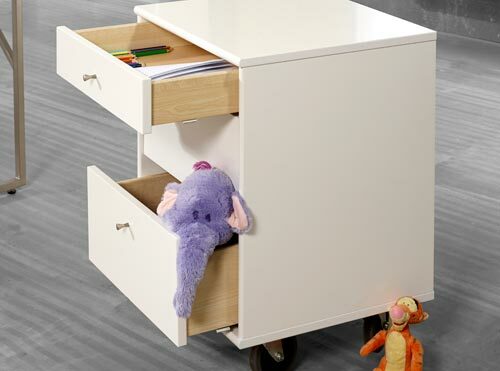 Mount castors and the movable trolley can be used for storage in many rooms. A small cabinet with many possibilities. Here it is used as a bedside table with a fabric drop-down door. Charge your mobile, while you are sleeping. There is hole for cable management in the top and bottom. Hide the plug inside. Shown in blue with black fabric drop-down door. Cabinet No. 032 is displayed again as bedside table. Charge your mobile, while you are sleeping. There is hole for cable management in the top and bottom. Hide the plug inside. 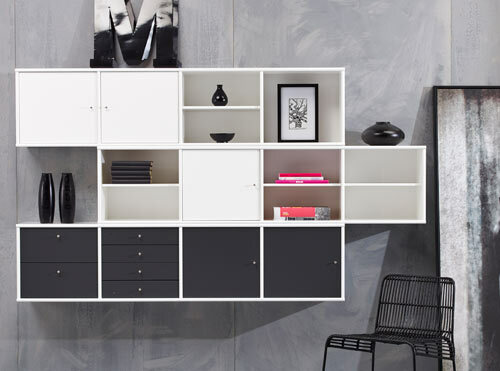 Shown in white with black fabric drop-down door. In the back you get a glimpse of a MISTRAL chest of drawers. 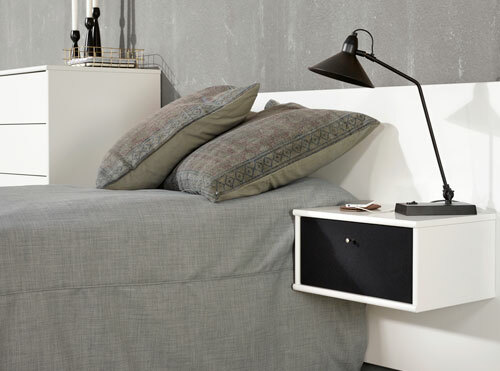 MISTRAL bedside table and chest of drawers. Asymmetry for the teenager with room for iPad, TV and much more. Use the shelf brackets alternatively to displaying e.g medals :-) Shown in black lacquer with a touch of red. MISTRAL cabinets for storage in the bedroom. Cabinet No. 102 as headboard, cabinet No. 038 as bedside table and a range of No. 001 cabinets for clothing storage. 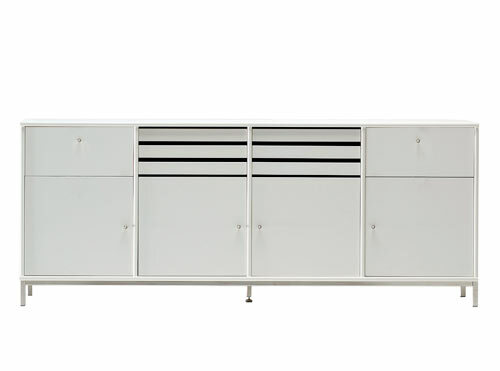 All cabinets are shown in white. 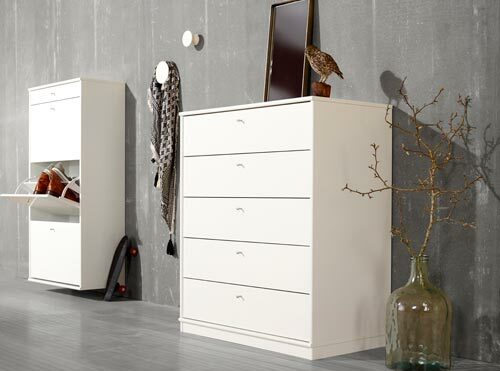 MISTRAL chest of drawers No. 406 with lots of space. Depth in total is 50cm. Very suitable for clothing. Available in white. 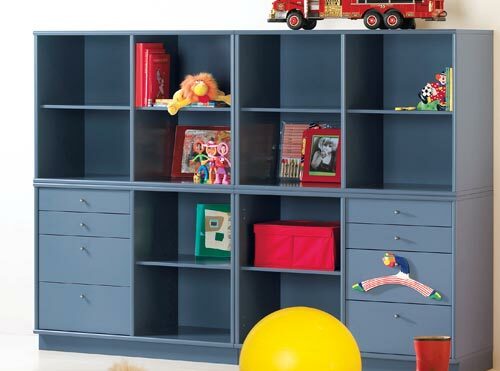 Modern, blue colour adds action to the children´s room. Here cabinets No. 001 are used. MISTRAL in blue for the children's room. Same arrangement but shown in a classic, graphite color. This color brings more attention to the stored items. MISTRAL for the children´s room. Asymmetry makes it possible to check iPad or mobile while standing. Hide or showcase what you want. MISTRAL in an elegant solution. 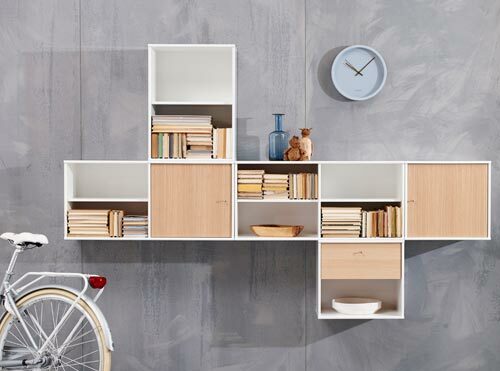 Shown in white and oak veneer. MISTRAL asymmetry for the teenager. 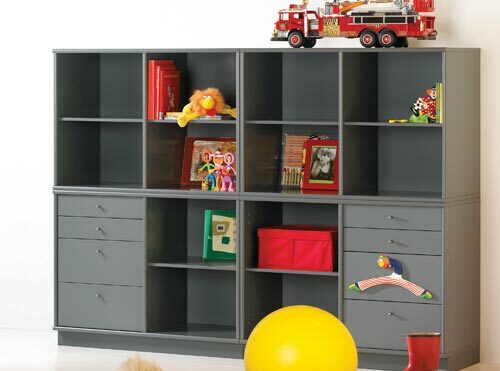 The bookcase is also very suitable for the children´s room. 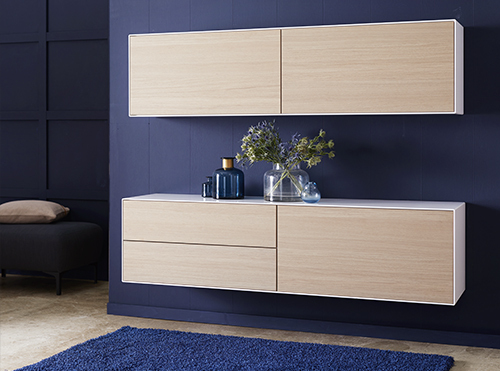 You have almost unending possibilities for adding drawers and doors in MISTRAL´s range of 15 lacquers colours and veneers. For security reasons please remember to mount the enclosed fitting into the wall. 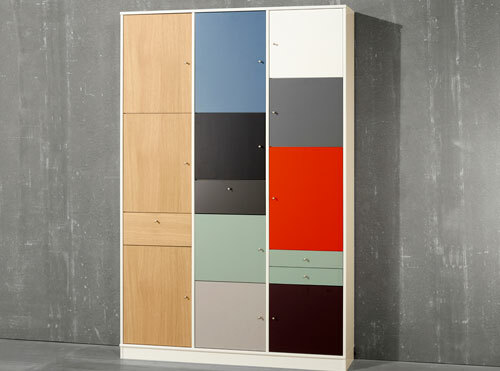 You have almost unending possibilities for adding drawers and doors in MISTRAL´s range of 15 lacquers colors and veneers. For security reasons please remember to mount the enclosed fitting into the wall. Shown with different front combinations. 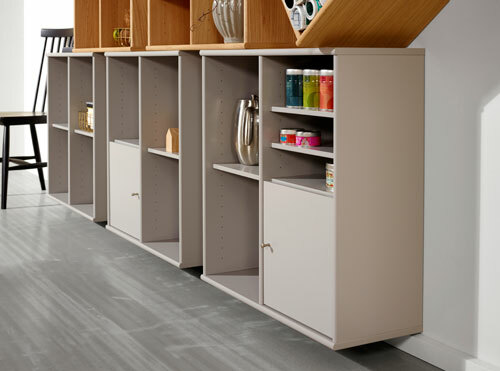 MISTRAL is not only for the wall, you can also place the cabinets on a beautiful plinth or mount a range of bases. This arrangement i oak soap treated veneer makes storage room for books, tablecloths, paper work etc. MISTRAL on plinth. Oak veneer. A larger arrangement with sideboard and highboard in beech soap treated veneer. 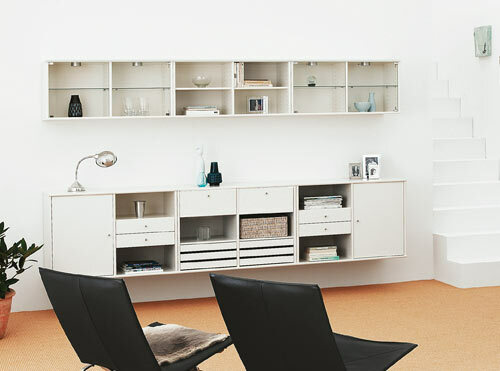 The highboard is without glass fronts. MISTRAL Classic in beech veneer. Add a little asymmetry to go for a modern look. 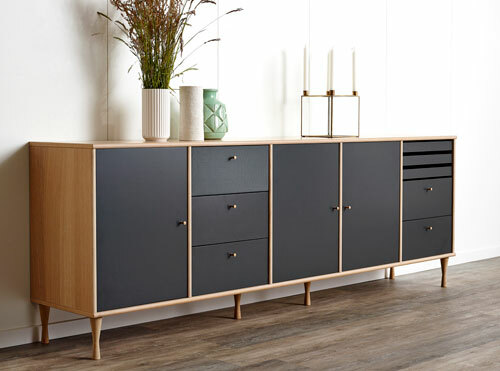 The sideboard is shown in oak soap treated veneer with anthracite fronts and sleek legs. Cabinet No. 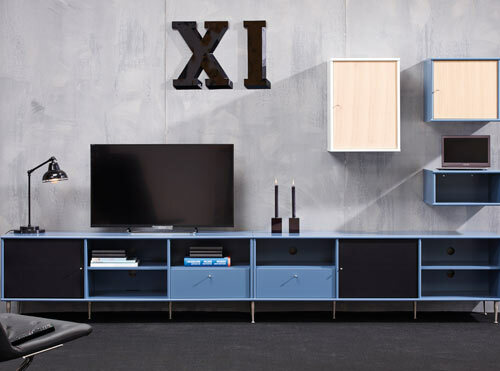 112 is used as sideboard, and above cabinets no. 114 & 113 are displayed. Classic MISTRAL arrangement consisting of sideboard No. 112 with legs and cabinet No. 113 (hanging). You have the option of adding glass doors to cabinet No. 113. Customize your personal arrangement. In this arrangement cabinet No. 037 in anthracite is placed between 2 No. 021´s in oak soap treated veneer. Be creative! Customize exactly the storage solution that matches you storage demand. Shown in oak soap treated veneer, light grey and black lacquer. MISTRAL mix colors and depths. Be creative! Customize exactly the storage solution that matches you storage demand. Shown in oak soap treated veneer, white and bordeaux-red lacquer. To the left MISTRAL AV cabinet No. 222 with white fabric door. In the front Iris nesting tables with white laminate on the top on solid oak base. MISTRAL mix colours and depths. 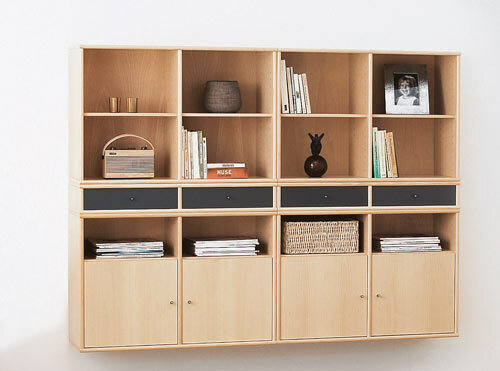 MISTRAL bookcase cabinets No. 025 with doors in bordeaux lacquer. To go for a symmetric or an asymmetric look, place the doors where you like. 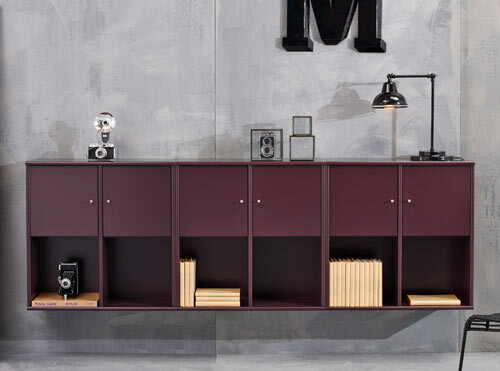 MISTRAL bookcases in bordeaux lacquer. Assymetric arrangement with cabinets No. 104 in white and anthracite lacquer. 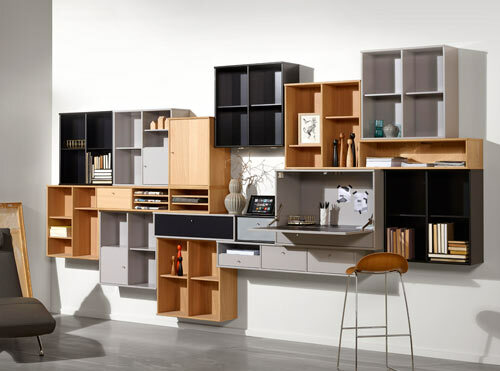 Asymmetric arrangement with 3 cabinets no. 041 in white provides a visual, airy look. Classic and timeless arrangement in white lacquer. 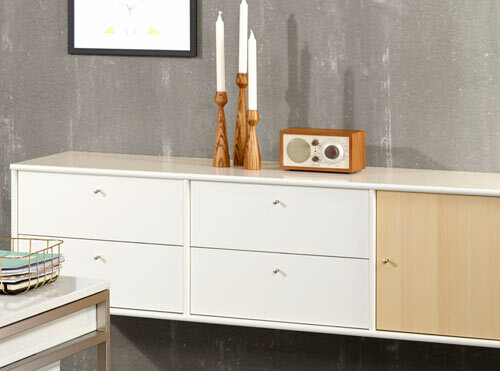 Sideboard with drawers, doors and trays. Highboard with glass doors. 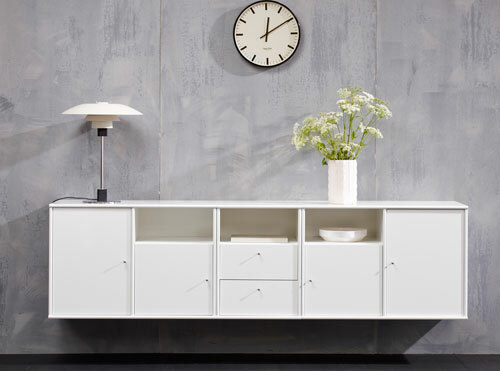 MISTRAL KUBUS sideboard in white can either be hung on the wall or placed on a base. Cabinet available in white. 1/1 and 1/2 doors available in white and oak soap treated. Elegant and sleek. 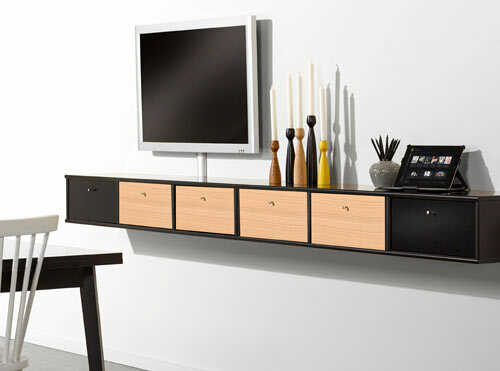 The MISTRAL AV cabinets are also suitable as sideboards! Use the cable hole in the top for wire management for lamps, iPads etc. 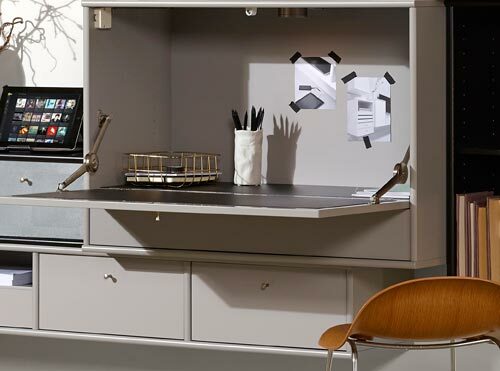 The spacious drawers (D 45cm) are suitable for storing items that do not fit in the MISTRAL cabinets. Hide loudspeakers behind fabric doors. The doors are shown in silver, and the cabinets are white lacquered. 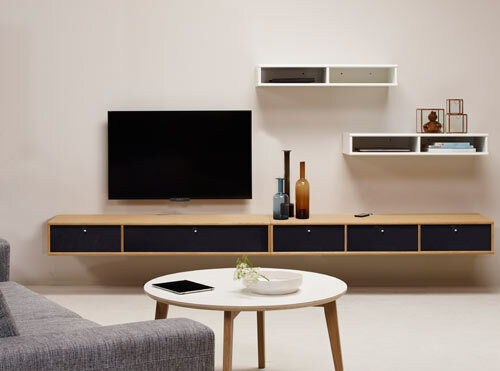 The MISTRAL AV cabinets are also suitable as sideboards! Use the cable hole in the top for wire management for lamps/iPads etc. 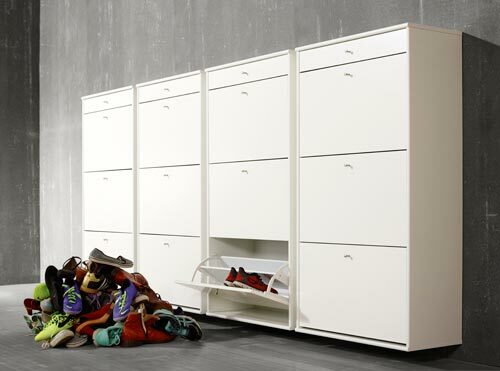 The spacious drawers (D 45cm) are suitable for storing items that do not fit in the MISTRAL cabinets. Larger MISTRAL AIR arrangement in white. Please notice the 2 No. 106 cabinets with fabric drop-down doors for hiding electronic devices. Use different depths to create a modern look. NB. cabinet No. 106 is width 88,4 cm compared to other cabinets that are width 88 cm. 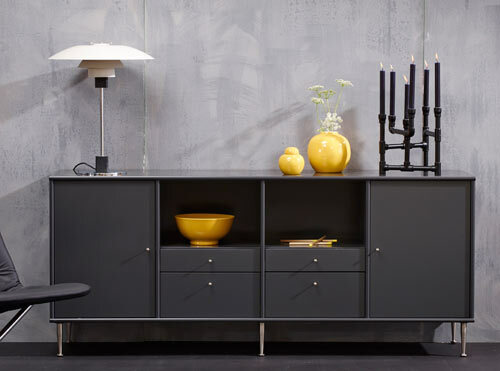 MISTRAL AV used as a sideboard. Check your mails or select music on your iPad while standing. The loudspeakers are hidden behind the white fabric drop-down doors. MISTRAL AV cabinet 034 with cable holes in top and bottom for easy cable management. MISTRAL AV black stained veneer. White fabric. 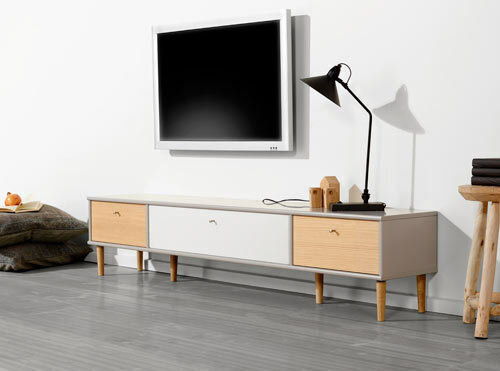 Long, slim cabinet on solid oak legs. 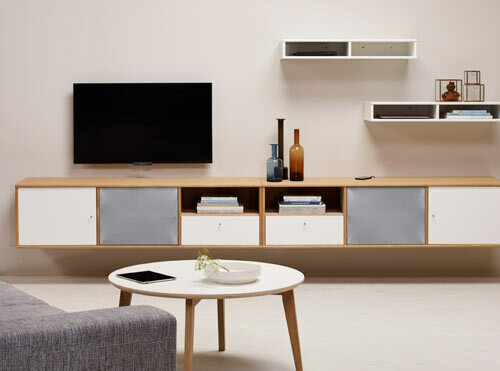 The MISTRAL AV cabinets are both suitable for hanging on the wall and standing on the floor. MISTRAL AV on a base. 2 cabinets No. 034 in oak veneer incl. fronts in black fabric and black lacquer. Cable hole in top and bottom for easy cable management. Sleek alu cover in the top for beautiful finish. Above 2 cabinets No. 037 in white. In the front Iris coffee table. MISTRAL AV soap oak veneer. Black fronts. 2 cabinets no. 232 in oak veneer with fronts in silver and white fabric. This cabinet suits the measurements of common electronic devices. Alu cover for cable hole in the top provides an elegant finish. Above 2 cabinets no. 037 i white. In the front Iris coffee table. MISTRAL AV soap oak veneer. Silver fabric. 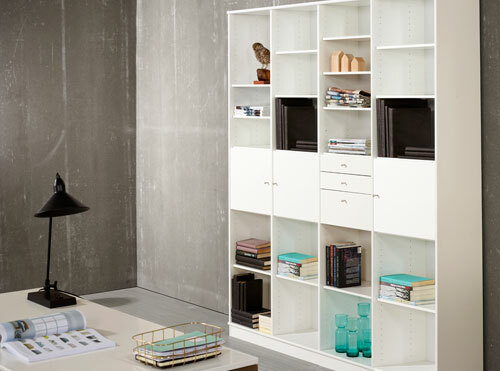 MISTRAL bookcase for books, accessories etc. Hide or display, it´s your choise. 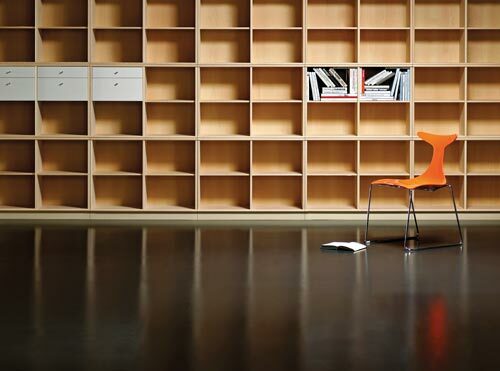 All MISTRAL fronts in depth 32.5 cm in all 15 MISTRAL colors and veneers are adaptable with the bookcase. Cabinet in anthracite No. 110 used as an elegant sideboard . Legs in brushed steel, No. 179. 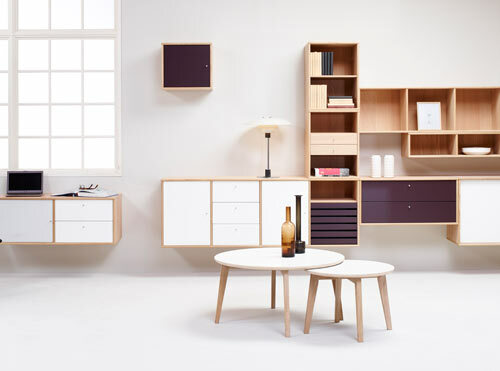 MISTRAL cabinet No. 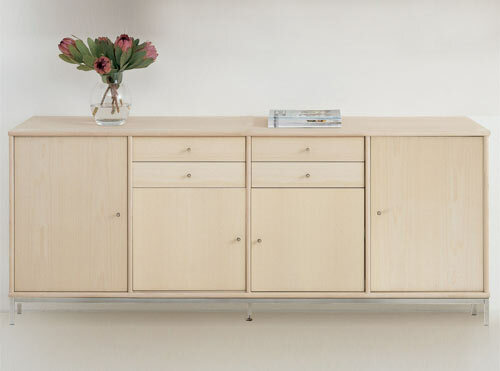 110 as sideboard in beech veneer. On a steel brushed metal base, No. 160. 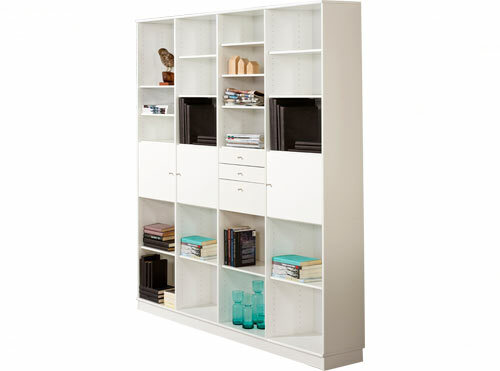 EDGE cabinet 203 in white with 2 drawers No. 020 and 1 flap in oak. At the top cabinet No. 201 in white with 2 flaps No. 014 in oak. 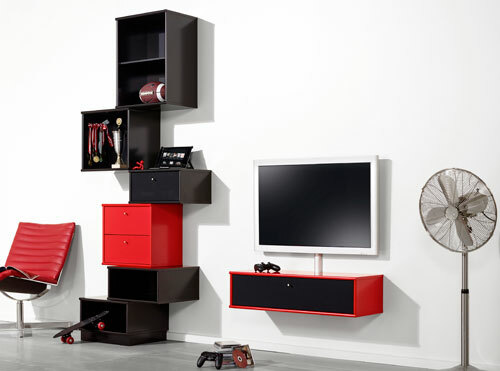 MISTRAL cabinet No. 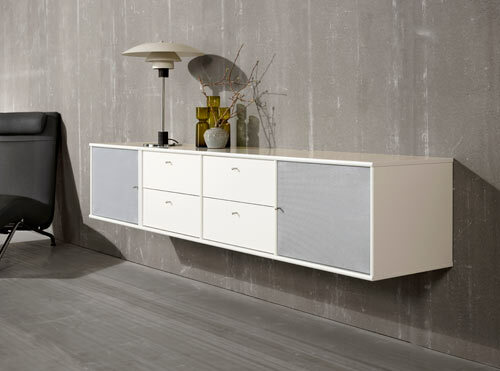 110 as sideboard in white lacquer. On a steel brushed metal base, No. 160. 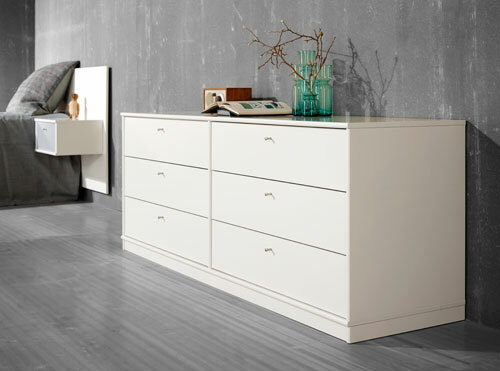 An elegant and timeless arrangement in white with both doors and drawers. MISTRAL cabinets No. 021+031 in white. Veneered dining table with wooden base and integrated extension. Measurements 140(240)x90x76 cm. 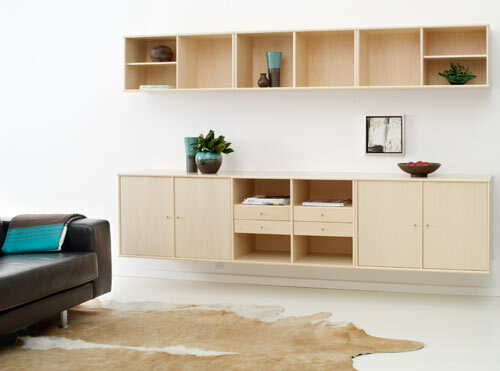 Shown in wengé finish but is also available in teak and cherry veneer. Veneered dining table with wooden base and integrated extension. Measurements 140(240)x90x76 cm. 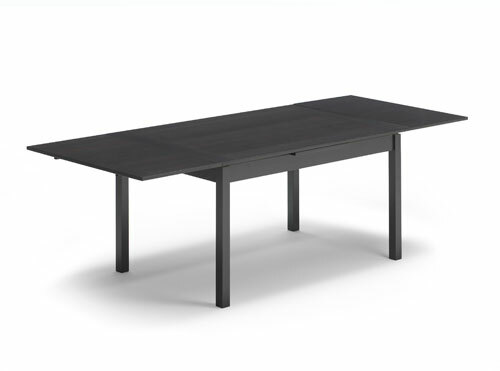 Shown extended and in wengé finish; table is also available in teak and cherry veneer. Veneered dining table with wooden base and integrated extension. Measurements 90(166)x90x76 cm. 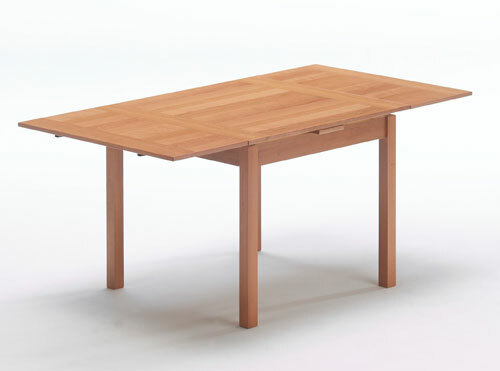 Shown in cherry finish but is also available in teak and wengé veneer. Veneered dining table with wooden base and integrated extension. Measurements 90(166)x90x76 cm. Shown extended and in cherry finish. 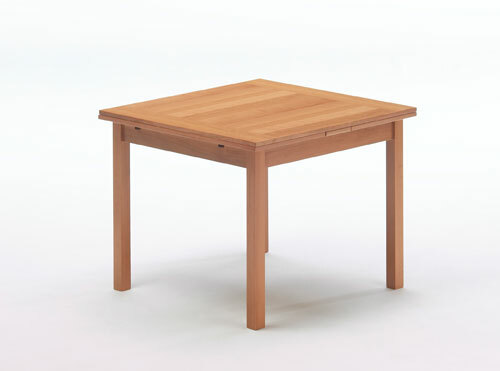 The table is so available in teak and wengé veneer. A little unequal! Leave your comfort zone and place a cabinet uneven for e.g. wine and poster storage. 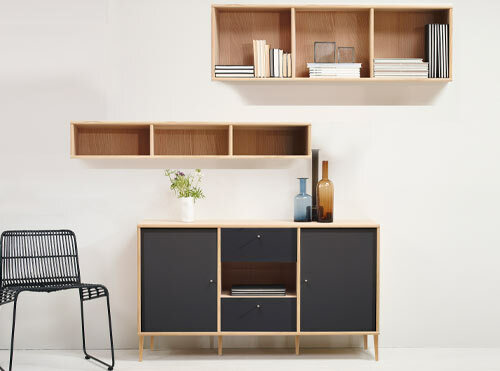 The cabinets are shown in light grey, oak veneer and black lacquer. 3 book cabinets No. 025 in light grey are used as base. Cabinet No. 031 is placed uneven. MISTRAL for the dining room. A bit unequal! Add more shelves and use the book cabinets No. 025 for beautiful tea cans. MISTRAL for the dining room. Close-up. 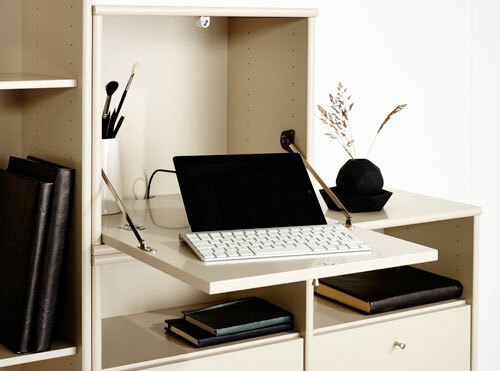 This arrangement invites to checking e-mails or selecting music on your iPad while standing. The loudspeakers are hidden behind black drop-down doors. AV cabinet No. 034 has cable hole in top and bottom for simple cable management. Fronts are in oak soap treated veneer. MISTRAL AV for the dining room. 3 No. 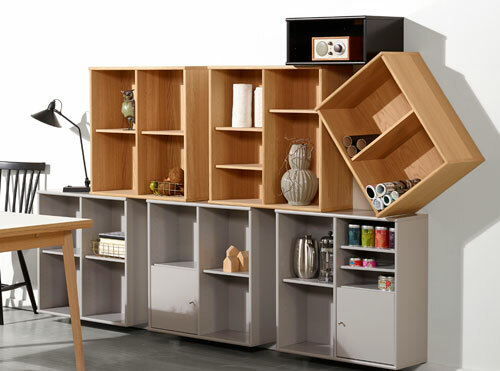 041 cabinet is an elegant and spacious storage solution in the dining room. Use the arrangement to display cookbooks, tea cans, beautiful tea pots etc. 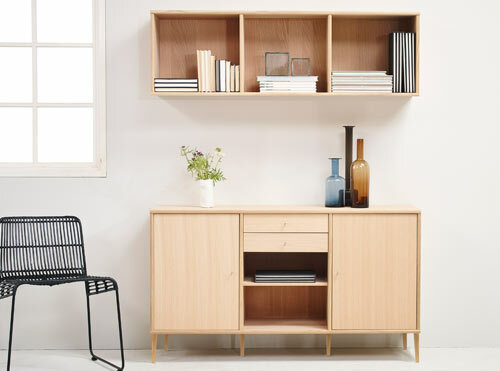 MISTRAL cabinet No. 041. Graphite. 2 AV cabinets No. 232 with drawers in blue and with fronts in black fabric. Lightens up every home. 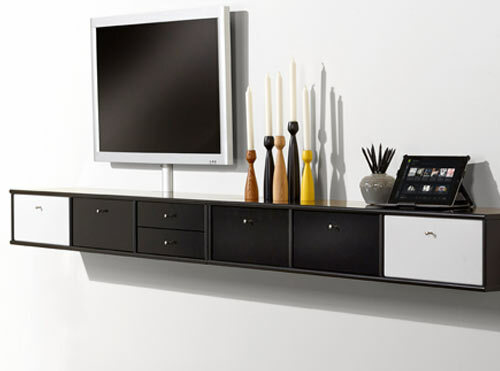 The cabinets are clever storage solutions for electronic devices. The depth is deeper that the other MISTRAL cabinets in order to meet the measurements for common electronic devices. MISTRAL AV in hot blue. MISTRAL AV cabinet No. 212, depth 45 cm, has space for most common electronic devices. 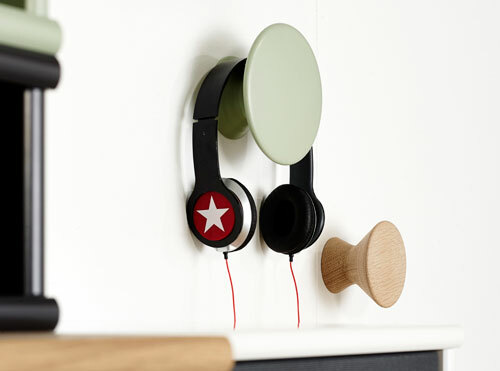 Place a loudspeaker behind a fabric door and manage the music from the mobile or the iPad from the top of the cabinet. MISTRAL AV cabinet No. 212.